PLEASE NOTE: These indices are not designed as a calendar of Irish saints which can be crossposted anywhere else. They are my original work and relate only to this site. I would ask that they not be posted elsewhere without my permission and certainly not without linking back to this blog. Content Copyright © Omnium Sanctorum Hiberniae 2012-2015. All rights reserved. I am an Irishwoman interested in the lives of our native saints. I am not a professional scholar in this field but attempt to keep up with the work of those who are. I am particularly interested in the many obscure Irish saints whose names fill the pages of our Martyrologies. 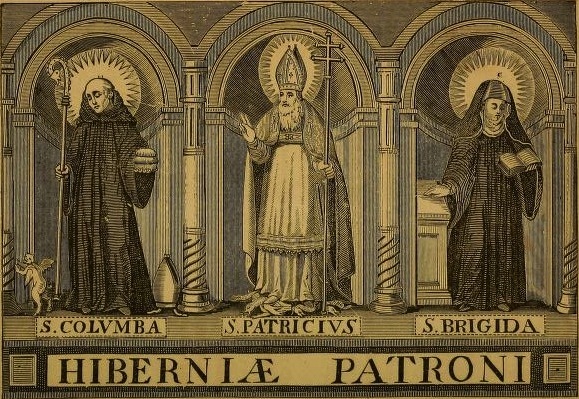 Omnium Sanctorum Hiberniae is dedicated to the saints of Ireland. The feast days of the saints are those recorded in the historic Irish calendars. These are not in every case the dates on which they are commemorated in the Church today. This blog represents my original work, even where I have used public domain sources. I am happy for others to use the materials here provided they respect my right to my intellectual property by linking back to this site. This also applies where posts have been translated into other languages and published elsewhere. One of the major sources used at this blog is the nine-volume Lives of the Irish Saints by John, Canon O'Hanlon (1821-1905). It is a work in the public domain and available through the Internet Archive. A post on the life and work of the 'Irish Bollandist' can be read here. Trias Thaumaturga is the sister blog to this site and houses an archive of posts specifically on the three wonderworking patron saints of Ireland, Saint Patrick, Saint Brigid and Saint Colum Cille. Visit it here. © Omnium Sanctorum Hiberniae 2012-2017. Simple theme. Powered by Blogger.